Whenever someone or something in a movie needs to blow up or get shot, a remote controlled firing system is used. Since the firing system can’t be seen on camera, it needs to be small so it can be easily hidden. Apparently the commercial systems you can buy may or may not be small enough. They might be, like, two or three times bigger than they need to be. That was the position Daniel Arvidsson and David Jensen found themselves in. Thanks to the Arduino, and a lot of experimentation, they produced a small open source squib firing system (but they also made it modular so it can do more than just fire squibs). Size comparison between the firecrow v1 and the Holatron, a professional squib firing system. What are your names and backgrounds? David: And mine is David Jensen, I’m a software developer and sort of a nerd. Bearded nerd. Not the big guru beard though. I’ve got two small kids, a wife and a house, no dog. Did you have any engineering experience before you started? Daniel: Hardly no electronic experience at all to start with. David: About a year before we started I heard about something called the “Arduino”, bought one and started playing with it a bit. Prior to that, no experience at all. I did know how to program though. But not C/C++. What made you decide to open source the project? Daniel: It’s a congenial way to make stuff and I like the idea of a contributing to a lifestyle where you build up a community; where everyone can help or be help without paying for support and updates. David: I’m a big fan of free software and a long time Linux user. I wouldn’t have found my way into electronics if it wasn’t for open hardware, especially the Arduino, making it easily accessible and fun, so I felt it was natural that whatever we did should be open hardware and open source. Did you choose one particular license over others? Why? 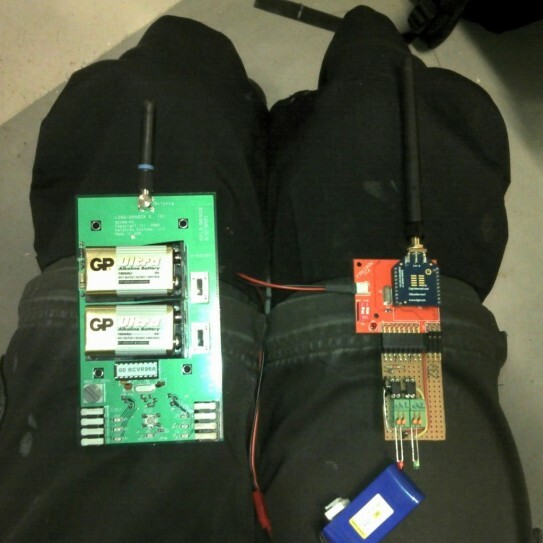 Daniel: TAPR – because it’s created by people who mainly makes wireless applications. I thought our system fitted that description well. David: GPL3 for the software since it has copyleft clauses that protects against being engulfed into a proprietary project. Also, copyleft licenses spread more freedom into the world. Were there any tools/resources that were vital to your success? Daniel: I use Cadsoft Eagle to make the schematics and PCB design, and we’ve used the Arduino as a development platform for the remote control. David: We use a port of the Arduino library in the firmware to ease development, without it it would take a lot more time. GCC, avrdude and gedit for development. Could you suggest one really important skill people should learn first? Daniel: Only to be patient and accept that it will take time if you don’t know what you’re doing to start with. Of course it helps a lot to have basic knowledge of electronics (and coding)! Did you ever make a major shift in the direction of the project? Why? How much of the project was individual effort and how much was social? David: If by individual we count the both of us you could say that most of the effort right now is individual. But it builds upon community efforts like the Arduino library. We wouldn’t be able to build it otherwise. Daniel: Also, in the beginning I got some help from electronic forums and googling the net about things that I didn’t understand, but otherwise no. Do you plan on selling anything when you’re finished? What do you think about open source as a philosophy? As a strategy? David: As stated above I love free software, I think that as a philosophy open hardware and free software gives us creativity and power as a community to change the world. As a business strategy for software I believe it’s the future, everyone should do it. Open hardware as a business strategy is a bit different though, but there are business doing well. It will be interesting to see what the future holds. In your wildest dreams, what would be open sourced next? David: Totally open hardware and drivers for the next Nexus Android phone, with easily accessible connectors.